Golden geckos, native to Vietnam and southeast Asia, are intriguing lizards, but aren't the popular pets their cousins are. It may be due in part to their nocturnal habits and their aversion to being handled, but whatever the reason, these geckos are usually readily available from breeders. If you're a night owl, this could be the pet gecko for you. Golden geckos are skittish and have delicate skin, so are not good candidates for handling. They also have a bit of a reputation for biting when stressed. This may not be the best starter gecko for a new owner, but if you're patient when handling is necessary, your gecko eventually should become docile. Like many geckos, the golden will shed its tail when very stressed, and can regenerate the tail. That said, however, this is an extreme response from the gecko, and a gecko never should be picked up by its tail. Female golden geckos tend to be a bit smaller than males. Males can be yellow-golden in color (sometimes with markings), while females tend to be darker and have more green. They have specialized toe pads that allow them to effortlessly move along vertical surfaces and upside down. A 20-gallon tall terrarium is sufficient for a golden gecko, but bigger is better as golden geckos are active lizards. Golden geckos need vertical space for climbing so use a tall tank. Males are territorial so should only be kept one to a cage. The substrate for golden geckos should be something that retains moisture, such as reptile bark or shredded coconut fiber bedding. Some keepers also use pure soil, but avoid using potting soil, which often contains perlite. Golden geckos need room to climb, so provide branches, driftwood, and silk or live plants. They also need hiding spots such as reptile caves or clay plant pots placed on their sides. If you have multiple geckos, be sure to provide enough hiding space to allow them to hide from each other. A small shallow water dish should be provided, with fresh water daily. They may use this more for soaking than drinking as golden geckos, like other geckos, prefer to drink water droplets from leaves. Since golden geckos are nocturnal there's no need for special UV lighting. However, many experts suggest that providing UV lighting is still beneficial to geckos' overall health. Check with your breeder or reptile veterinarian for advice about your specific gecko. A daytime temperature gradient of 75 to 90 degrees should be provided for golden geckos, with a drop at nighttime to 70 to 75 degrees. Heat can be provided via a ceramic heat element or reptile light bulbs in a reflector. White incandescent bulbs or blue reptile bulbs can also be used during daytime hours, and red reptile night bulbs can be used at night. Do not rest a heat source right the top of the tank, as these climbing geckos could get too close and burns could result. Golden geckos need a moderate to high humidity level; aim for 60 to 80 percent relative humidity. The best way to measure it is to get a hygrometer and monitor levels as humidity is very important. Provide humidity with regular misting; the geckos will likely drink from water droplets left from the mist. Golden geckos should be fed a variety of insect prey items. Crickets can make up the main part of the diet, with the addition of waxworms, mealworms, butterworms, roaches, and other insect prey. A gecko's prey should be gut loaded prior to feeding and dusted with a calcium supplement two to three times a week and a multivitamin once a week. Feed your golden gecko in the evening; juveniles should be fed daily. Adults do not need to be fed every day. Some keepers recommend varying the feeding schedule to keep the geckos interested in their prey; for instance, feed every other day, then feed two days then skip a day, and so on. Feed as much prey at one time as the gecko eagerly eats. Golden geckos will often take fruit as well, you can try mashed bananas, pureed baby food, or sliced fruit, especially tropical fruits such as mangos. Golden geckos are usually readily available from breeders since they tend to be lower-profile and less popular compared to leopard geckos or crested geckos. Be wary of wild-caught golden geckos since you don't have any way of knowing their health history or about any parasites they may be carrying. 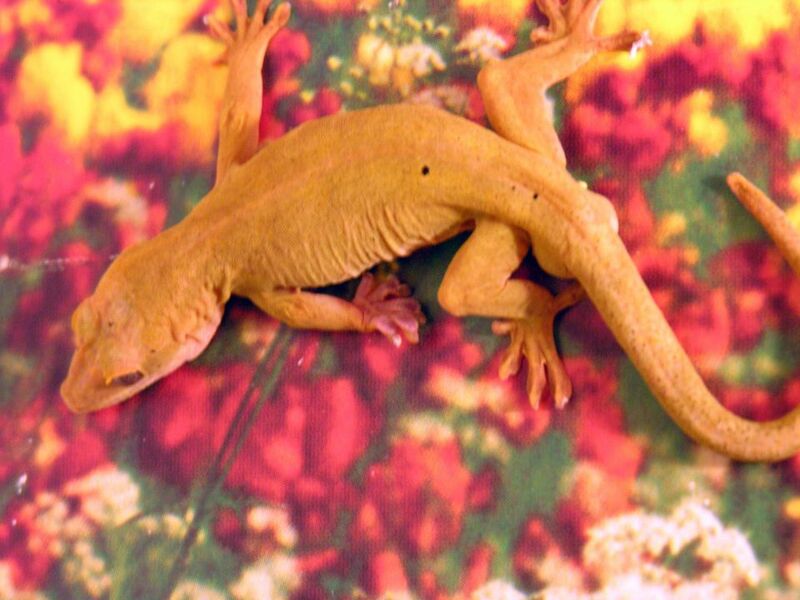 Captive-bred golden geckos tend to be healthier. Before you purchase a golden gecko, inspect its skin for any sign of dry patches, which could indicate problems shedding, and watch the animal eat if possible to ensure it has a healthy appetite. One of the most common ailments among geckos is metabolic bone disease (MBD), which is the result of insufficient calcium and vitamin D it the animal's diet. Geckos with MBD will display a poor appetite and tremors, and sometimes can suffer painful limb deformities. Golden geckos that are undernourished or that live in an enclosure with insufficient humidity could develop dysecdysis. This condition causes the gecko to have difficulty shedding and can affect its vision. It usually looks like a patch of dry or rough skin when it first develops. And like other geckos, goldens are prone to of respiratory infections, including pneumonia. If your gecko is drooling or wheezing, or has excess mucus around its nasal passages, these may indicate respiratory problems. All of these conditions should receive treatment from a veterinarian who specializes in reptiles and lizards. Most geckos will recover from the above illnesses if treated in a timely manner. You also can check out our other gecko profiles here.